Congratulations to Brenda Romero, one of our brilliant speakers, on the announcement of a new game being developed with Paradox Interactive. Variety reports that the original IP is “…a new strategy game, which is set to be revealed at E3 2019”. You can sign up at the official website to get more information prior to E3. We are delighted for Brenda and everyone at Romero Games. Looking forward to learning more in the coming months! The attendees ranged from experienced professionals and academics to aspiring game designers and filmmakers, including current UCC undergraduates. It was livestreamed, as well as being livetweeted using the hashtag #WomenMakeMedia. We had three cameras recording video and plan to release a edited version for free online. There will also be a transcript in both English and Irish at a later point. In the meantime, we will be posting photos here as we receive them. If you’d like to follow our speakers on Twitter, we have them all in a handy list. Thank you to everyone who spoke, helped organise, and attended. What an amazing day. Let’s do this again! Posted in PressTagged brenda murphy, brenda romero, event, joanna dukkipati, sarah arnold, shubhangi karmakar, symposium, ucc, ucc women's studiesLeave a Comment on That’s A Wrap! On Tuesday, 19 March, Doris Murphy, co-organiser of the first Women Producing Media event, spoke on air to Cailean Coffey of UCC 98.3 FM. The radio station is part of University College Cork. It’s about 20 minutes long and touches on Doris’s background organising for the Repeal the 8th campaign, the origins of Women Producing Media, who our speakers are, and our efforts to make the symposium accessible. Many thanks to Cailean for the chance to speak about the event! 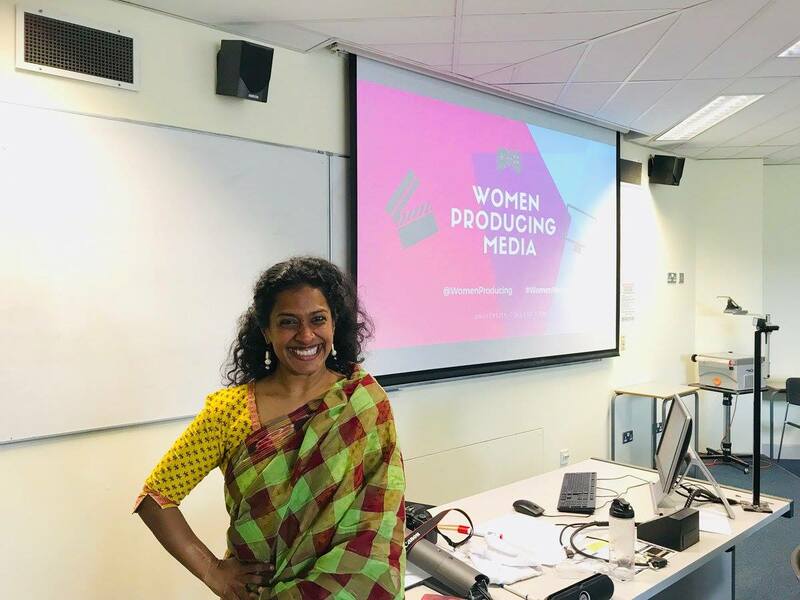 CORK, IRELAND – On Friday, March 22, 2019, the first Women Producing Media symposium will be held at University College Cork. Improving gender balance and diversity in production crews is an important part of the equation when it comes to modernising representation on screen and in print. The event will take place in Room 212 of the O’Rahilly Building at UCC from 3 to 5 p.m. Women just starting out in media, experienced women who would like to network, and academics interested in diversity and inclusion in media are encouraged to attend. The topics will be addressed in a way that will be meaningful creative workers, the public, and academics. Our speakers are Brenda Romero, game designer and Fulbright recipient; Joanna Dukkipati, publisher and online radio producer; Shubhangi Karmakar, writer, medical researcher, and activist; Dr. Sarah Arnold, lecturer in Media at Maynooth; and Prof. Brenda Murphy, researcher in gender and media at the University of Malta. Women account for 50% of film audiences around the world, yet of the top 100 grossing films of 2018, women only represented 4% of directors, 15% of writers, and 3% of cinematographers. Similar disparities can be found across all aspects of digital media production. Every awards season there are ‘firsts’ for women and minorities, but their contributions should be part of the norm, rather than the exception. This is the first event by Women Producing Media and was done with the support of the Women’s Studies programme at UCC. The response has been overwhelmingly positive. It is intended to be a recurring event, with plans to expand internationally at a later date. More information can be found at womenproducingmedia.com. We welcome press inquiries and invite photographers and journalists to attend.